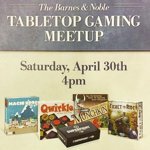 Barnes & Noble has partnered with a number of publishers, ourselves included, to host Barnes & Noble Game Night on Saturday, April 30th! Not only that, but they've expanded it to every one of their 640 stores. So if you have a store near you, come out and play this Saturday. In addition to Munchkin Deluxe, there will be games from other publishers, like Superfight, Quirkle, Ticket to Ride, and Machi Koro, so you can get a variety of what the boardgame and tabletop hobby has to offer. You can even pick up some Munchkin promos, and who knows, there may be some special surprises! Check out your local Barnes & Noble store this Saturday at 4PM, and get your game on!